I just sold this House at 812 Intervale Avenue, Victoria, BC. During the month of July in Esquimalt there was fifteen single family homes sold and year-to-date a total of seventyseven. The price range of sales in July were between $300,000. - $649,000. 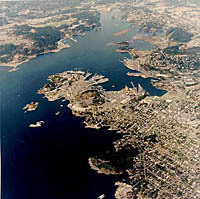 in Esquimalt. Currently there are over five thousand listings on MLS® in Victoria. I don't remember having this amount of inventory for buyers since 1995. Statistically, September will be more active with Victoria properties selling.